HOMANN HEIRS. -Regni Sinae vel Sinae propriae..
HOMANN HEIRS. - Regni Sinae vel Sinae propriae..
Regni Sinae vel Sinae propriae.. - HOMANN HEIRS. Size : 23.0 x 20.5 inches. / 58.5 x 52.1 cm. 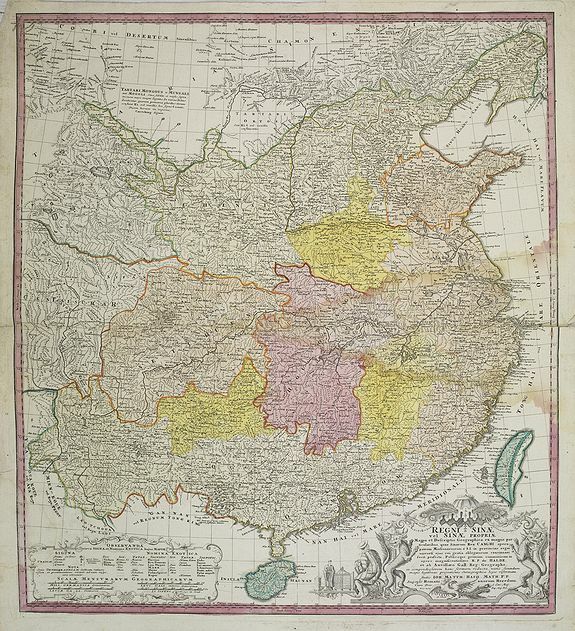 Description :General map of China, including the islands of Taiwan and Hainan. The map is based on the work of du Halde. An appealing title cartouche bottom right with allegorical images. Taiwan with many place names, the island is divided in two by a border line and the western part is coloured in full. Condition : Paper very slightly age toned, with water staining. Repair of split in lower part centerfold.